You are currently browsing the Science Fiction Brewed Fresh Daily blog archives for the day Monday, August 17th, 2009. As of today, there have been a full three years of this nonsense. We haven’t missed a weekday post since Christmas of 2006. Clearly, we need a hobby. Or possibly sedation. 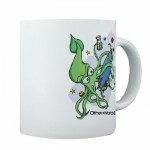 To celebrate, if you comment on a post this week you’ll be entered in a random drawing to win an O*W*C mug, complete with menacing space squid!